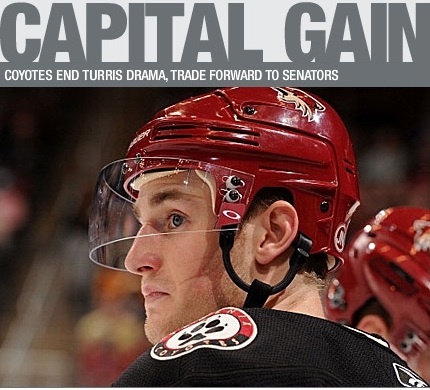 One good thing about this trade: TSN dusts off the ol’ “Capital Gain” headline. Okay, so let’s take the following epithets: “Build from the net out.” “Slow and steady rebuild.” “Five year plan.” And put those in a basket and then just sort of pitch them flaming into the night sky. Because the dream scenario of having three elite defensemen capable of playing 20+ minutes a night, playing solid two-way hockey, and driving the offense for years, of combining them with solid goaltending, and of complementing them with available and affordable 20-goal scorers, is now null. It’s not that I don’t agree that the team has its share of depth on the backend, or that forward depth is a priority, or that Cowen and Karlsson are both working out wonderfully, or that the options for the 2nd line center pivot in Zibanejad, DaCosta and Regin are seriously lacking at the moment. It’s just that this isn’t the right time to trade a bluechip prospect, isn’t the maximum yield for that trade, and isn’t the right time for the franchise to be taking on more risk. It’s the Vermette situation all over again: a good player, who you know you can turn into an asset that will help the team, is flipped in the name of winning now. Like the Vermette trade, this could burn Ottawa in a big way. Remember where Karlsson was halfway through his first season? Sent down to the AHL for some conditioning, looking small and overmatched, he showed flashes of offensive brilliance but was thought to be a player who might only be used selectively. And if he turned out to only be a powerplay specialist, no one would have minded if he were traded at the time for a player who could “help the team now.” After all, the team had yet to admit that it couldn’t compete. The playoffs were in sight. 1) Why trade Rundblad now, after a third of a season, when in a season or two he might be at his most valuable? You’d think Karlsson now might get more than just a Turris-like reclamation project. If Rundblad comes anywhere close to Karlsson’s current state, one thinks he might have gotten much more. 2) Why trade the pick that turned into Tarasenko for Rundblad only to trade Rundblad two seasons later for a player looking less likely to succeed than Tarasenko? If this club is lacking in offense, the players available at the time of the draft might have provided the same services, and without two or three seasons of wasted development. There’s no doubt that Turris is an elite prospect – or, at least once was – but Ottawa shouldn’t be taking these kinds of risks at this point in the rebuild. Rundblad was as close to a sure thing as you could get. And he’s traded, well before he reaches full value, for a lottery ticket. It’s almost as if the team is caught up in being a bubble team and is fantasizing about that sweet playoff revenue. Gotta pay for that scoreboard, I guess. Oh yeah, and they needed to throw in a second round pick! Which could very well turn into a very high pick if the team plays more like people expected them to! Perfect. -Karlsson played minutes against good competition, Rundblad plays sheltered minutes. -while Karlsson wasn’t ready he didnt totally implode, Rundblad has pretty much imploded. Its pretty clear that Rundblad needs to completely change the way he plays at age 21 because it isnt working in the NHL. How is he a blue chip prospect anymore? Hes a really tought fit on this team as well. He isnt good enough to play sheltered minutes in the nhl, apparently he doesnt want to play in the nhl (so it would seem), and going back to sweden wont do him much good. I think it’s way too soon to tell with Rundblad, but for a guy who did absolutely everything he could as a defenseman in the SEL, playing against men, the team was right to ease him in to the NHL. He hasn’t played great, but then again he’s getting seven minutes of ice time some nights. If he had developed into half the player Karlsson is, the team could really gotten a return for him. I don’t think it’s fair to say that trading for a 22 year old four years removed from being picked 3rd overall is the same as trading for Leclaire. He didn’t like the system in Phoenix, and obviously Murray and Maclean agree that Turris would have more success here. We overpaid for sure. But to say that this is being made without the future in mind is somewhat unfair. If you consider that Cowen and Karlsson are developing our top two defensemen in the long term, and the fact that the 5/6 pairing is usually interchangeable, that means that there are two spots on our defense that we’re looking to fill long-term. On the other hand, there are 12 forward positions, and Turris is a young guy who could turn out great. I wouldn’t say he’s any more of a slam dunk than Rundblad is, and if Murray and Maclean were thrilled with how he was developing, we wouldn’t be having this conversation. In the end, it’s a gamble for a gamble, and while Rundblad is a safer bet, he’s we’re dealing from a position of strength. If Turris can step up in this system, and he’ll definitely be given more of a chance than Rundblad was, then we’ll be happy. Either way, worst case scenario is that he flops, and Rundblad becomes a beast. Well, I agree that the team traded from its position of strength to fill a need, I just think they could have better filled that need when Rundblad was worth more, which I think he would have been had they waited more than 1/3 of a season for him to develop. We’re talking about a guy who accomplished everything he could have at his position in the SEL. As for the Leclaire comparison, I think it’s troublingly closer than we think. Leclaire hadn’t had success, but he had pedigree, and Murray thought that given the chance to succeed that he would. That proved a gamble, and it didn’t pay off. Turris isn’t so different. Great pedigree, but a gamble. I think we could have got more for Rundblad than a gamble. I agree. If I had known we were shopping Rundblad, I woulda been thinking much bigger than Kyle Turris. But apparently Maloney was pushing to get our first round pick. Apparently, Rundblad and a 2nd is less attractive to Maloney, and less of an asset to Murray, than a projected mid/high first round pick. There must be something we don’t know. And if it weren’t for the fanfare surrounding Rundblad based on his success in Sweden, then this would not seem so heartbreaking. Rundblad has not looked good here so far, but fans are giving him a lot of slack since he has such a high potential. Apparently, the executives and professionals are not valuing him as highly as we have. The trade, from my perspective, seems so strange that I’m willing to assume there’s a lot that we don’t know about this situation. Neither Turris nor Rundblad have accomplished anything in the NHL, and they’re a year apart. While we overpaid, obviously Murray thought it necessary to outbid every other team by offering Rundblad, and if it weren’t for Murray, Rundblad would just be some dude in the St Louis system. So I’m okay with it. I absolutely agree. We’re essentially giving up a 1st round pick (Runblad) AND a 2nd round pick for a huge gamble. It’s prospect management at it’s worst. The biggest concern with Murray has always been how he will handle things if the team plays well. It really feels like he’s already pulled the ripcord on the rebuild. I wouldn’t go as far as to say pulled the ripcord on the rebuild. Turris is also a developing “star” and fills a need for a second line centre. Yes we overpaid. Thats the way it works sometimes though; some trades you win some you lose. I don’t know much about Turris other than the fact that he held out signing another contract due to “differences” in opinion with management, which again doesn’t reflect well of him. Maybe he has Heatley syndrome though, and the change will be good for him. I don’t believe he will recieve as much slack as Runbald though. Everyone knew the deal with Runbald, he is developing, and will be a beast come future bouts; but with Turris I think there is more of an expectation to be better now. Either way I didn’t like the trade, but thats because I don’t squat about Turris.